Hecate or Hekate (/?h?k?ti?, ?h?k?t/; Greek ???? ?, Hekát?) is a goddess in Greek religion and mythology, most often shown holding two torches or a key and in later periods depicted in triple form. 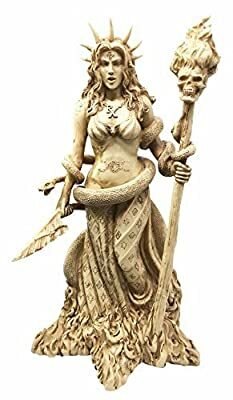 She was variously associated with crossroads, entrance-ways, dogs, light, the moon, magic, witchcraft, knowledge of herbs and poisonous plants, ghosts, necromancy, and sorcery. In the post-Christian writings of the Chaldean Oracles (2nd-3rd century CE) she was regarded with (some) rulership over earth, sea and sky, as well as a more universal role as Saviour (Soteira), Mother of Angels and the Cosmic World Soul. She was one of the main deities worshiped in Athenian households as a protective goddess and one who bestowed prosperity and daily blessings on the family. Hecate may have originated among the Carians of Anatolia, where variants of her name are found as names given to children. 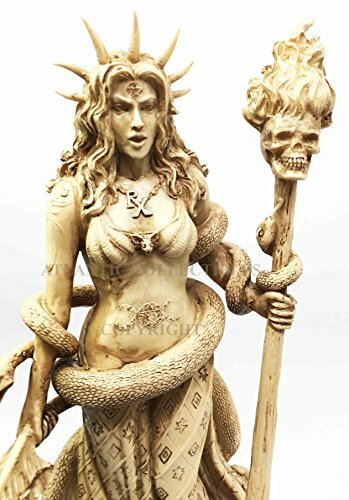 Hecate was also worshipped in the ancient city of Colchis. William Berg observes, "Since children are not called after spooks, it is safe to assume that Carian theophoric names involving hekat- refer to a major deity free from the dark and unsavoury ties to the underworld and to witchcraft associated with the Hecate of classical Athens." She also closely parallels the Roman goddess Trivia, with whom she was identified in Rome.